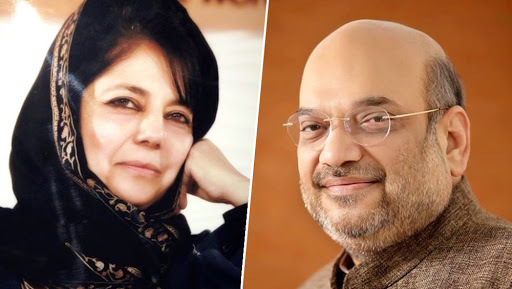 Srinagar, April 12: People's Democratic Party chief Mehbooba Mufti on Friday lashed out Bharatiya Janata Party president Amit Shah for allegedly marginalising and diving people in the name of religion and attacking the secular culture of the country. Hitting out at Shah in Srinagar on Friday for attacking the secular culture of the country, Mufti said, "Language being used by Amit Shah and his men for votes in this election, isn't right. India is a secular country." Delhi High Court Judge Recuses Self from Hearing Plea to Bar Farooq, Omar Abdullah and Mehbooba Mufti from Lok Sabha Elections 2019. She was also of the opinion that India is a secular country and Shah should apologise for his remarks on removing every single infiltrator from the country 'except Buddha, Hindus and Sikhs'. She said, "Such statements are intended to shake country's foundations. They are an attack on secular culture of this country." She also attacked Shah for BJP's vision of India and its intentions to implement NRC and scrap Article 370 in Jammu and Kashmir. Mufti said, "J&K had decided to join India keeping in mind its secular culture. I think Amit Shah should apologise to people of this country because the foundation of this country has been laid on secularism. It's not only for Hindu, Sikh or Muslim, the country is for everyone." Earlier, addressing a political rally in Darjeeling, Shah had said, "We will remove Article 370 from Kashmir after forming the next BJP government at the centre." Calling the infiltrator 'termites', Shah said, "We will ensure implementation of NRC in the entire country. We will remove every single infiltrator from the country, except Buddha, Hindus and Sikhs."